Hard to Find 2007 Holiday Angel, Canadian, Pink Label, NRFB! 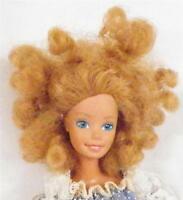 Doll is excellent but clothes too often have faded white spots in the pink. Wish pictures were better to show this factory flaw so you know if you want to buy it. Some sellers use a general photo and not the actual one of the actual doll. 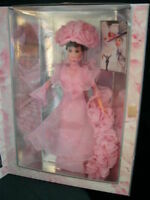 This doll resembles Audrey Hepburn's elegance. but her head sculpt & facial screenings look a little bit harsh, the details of the dress are very accurate, but the thick & bulky material used to make this dress certainly isnt the best quality. if you compare her with Mattel's 3 Elizabeth Taylor dolls and 2 Vivian Leigh dolls from the "Timeless Treasures" collections, you'd agree the other two faces were more detailed and lifelike. Overall, this is the best Audrey Hepburn doll you can find in the market, other doll companies' Hepburn dolls are just not up to my standard. Very realistic, beautiful and stylish doll of Audrey Hepburn! Audrey Hepburn is my favourite actor. She is so pretty, intensive, smart, funny and stylish! She is a real movie and a fashion icon. This version is very typical for her. A must have for all barbie collectors! About perfection. Mattell did a wonder copy of one of the cutest faces. Her hair. Her clothes she looked like she walked out of tiffany's with several things carried for her of corse. Hehe.